Well well well, I guess it's time that I posted something up on here. I decided to bust my FGFB cherry by talking to you my friends, about a subject near and dear to my struggling, oversized heart, ice cream. Much like the brand of condoms I wear, Magnum, this brand of ice cream bars had me when i first saw their beautifully designed box. The package design immediately made me think of the ever so incredible world of Dove chocolate. much UNLIKE the body part that goes into the brand of condoms that this ice cream is named after, I was slightly disappointed with the size of the ice cream bar in my hand, but still, the anticipation of a smooth dark chocolate outer shell and rich vanilla bean filling made me quickly dismiss the lackluster size of the bar. Biting into the Magnum Dark's brittle outer shell and taking a mouthful of the virgin white vanilla bean ice cream was anything but stellar. As basic as a dark chocolate ice cream bar is, Magums packaging decieved me into thinking this was the Cadillac of ice cream bars, but in all actuality, it's more like my 1991 Cutlas Ciera that gets me where I need to go, but thats about it. Flavor wise the dark chocolate wasn't bad, but in no way harkened back to the Dove Dark chocolate that I fondly remember. The Vanilla Bean middle only served up a splash of vanilla flavor, not good, not bad. Overall, a very mediocre experience. I won't get these ever again, but i give the design boys credit, They got me. 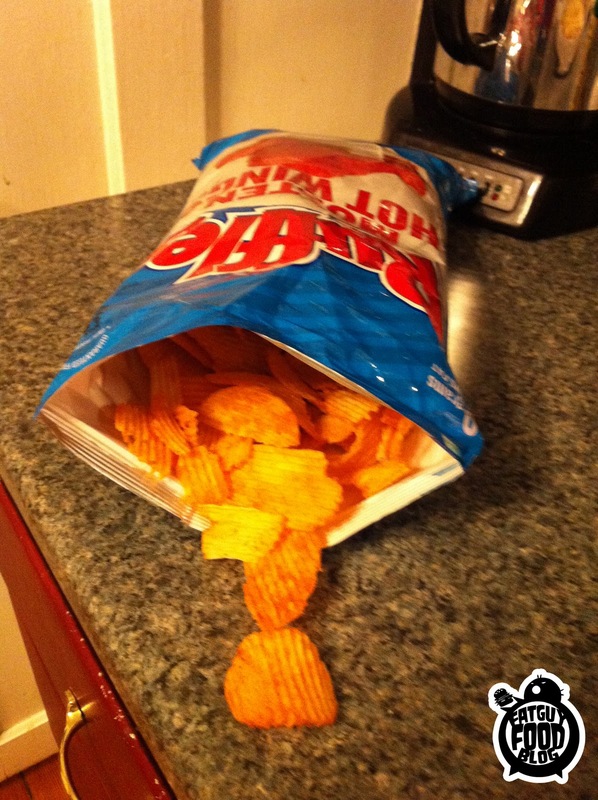 New Ruffles flavors in a three way dance. Who wins??? 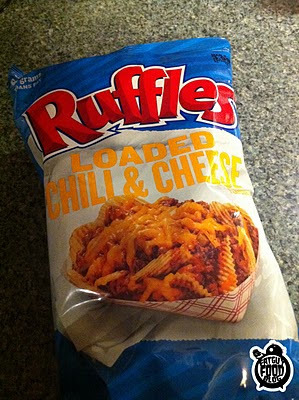 So Ruffles have decided to step it up and release some crazy new flavors. If there's one thing fat guys enjoy, it's new flavors of anything. Even if they end up being disgusting, we get excited when we see them in the store. So when I happened upon MOLTEN HOT WING RUFFLES, I was pretty pumped. But the next day someone told me that LOADED CHILI & CHEESE Ruffles existed, so I went on a search for them. A week after that, I hear through the grapevine that LEGENDARY PHILLY CHEESESTEAK RUFFLES are now on the shelves. So I ventured out for those too. What does that leave us with? Three new flavors. Let's pit them against each other in a battle to the death. 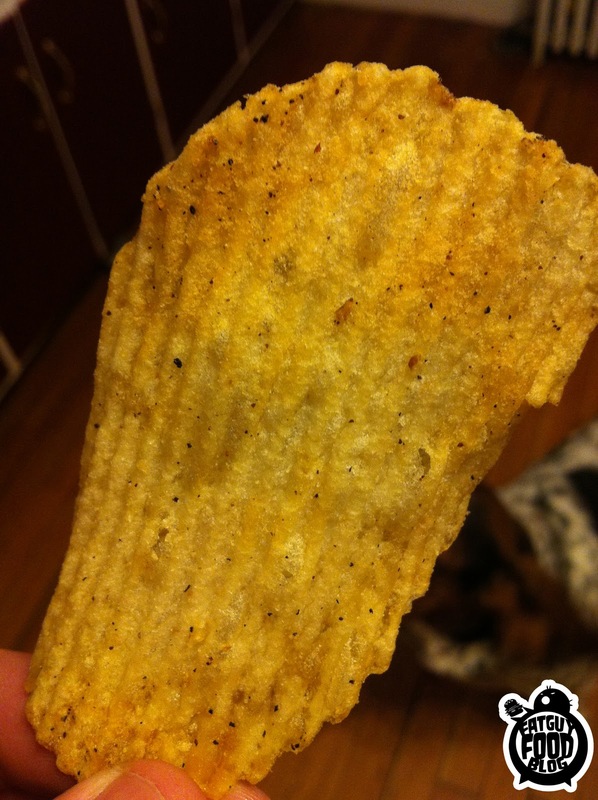 A chip cage match, if you will. Three will enter. One will leave. Let us begin. 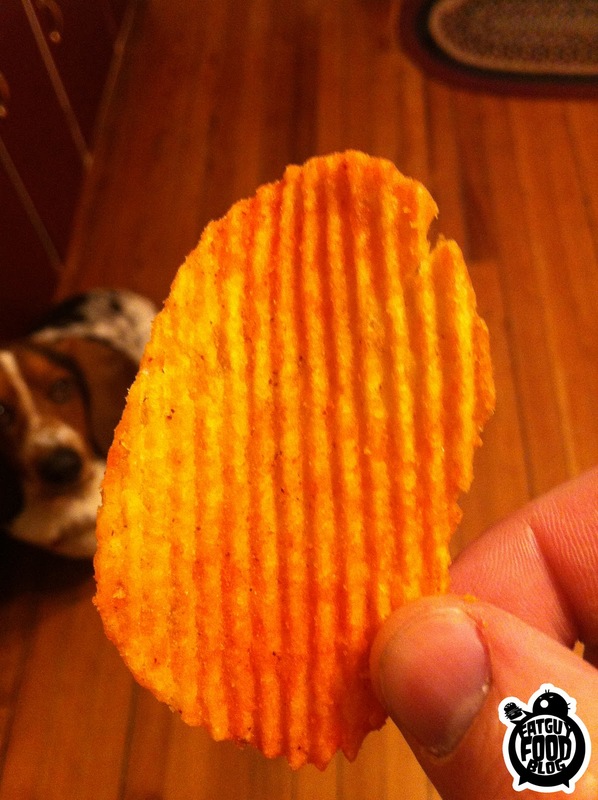 Simply put, these chips are fantastic. Tangy and spicy, but not TOO spicy. If you eat a ton of them you will feel the burn for sure, but otherwise even the biggest of wimps will be able to enjoy these. There is definitely another flavor that sets them aside. 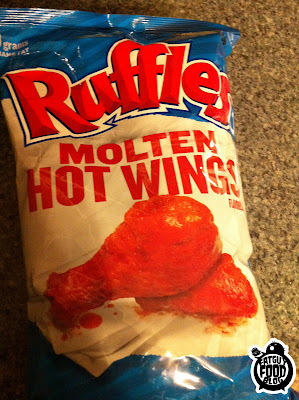 It's hard to explain but they really do taste like you're eating some kind of buffalo chicken. I don't really want to say that it's a chicken flavor, because that sounds kind of gross. Let's just say that their flavor is interesting and is hard to resist. Bottom line? 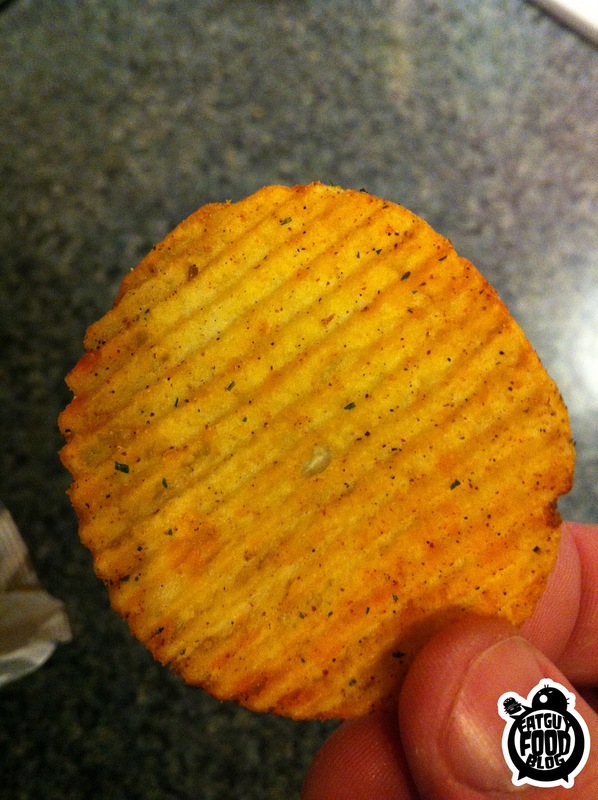 These chips are great. The first night we opened a bag at a gathering the entire bag got polished off in no time. 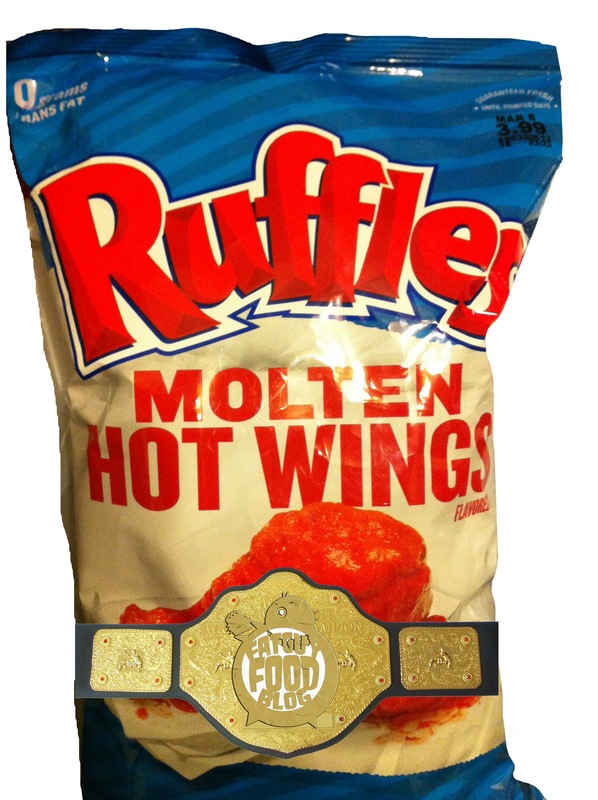 Molten Hot Wings Ruffles put on a powerful performance that the next two contestants will have a hard time following up. Think of every time you've ever had some cheap taco mix or anything of the sort where it comes with that packet of chili powder. 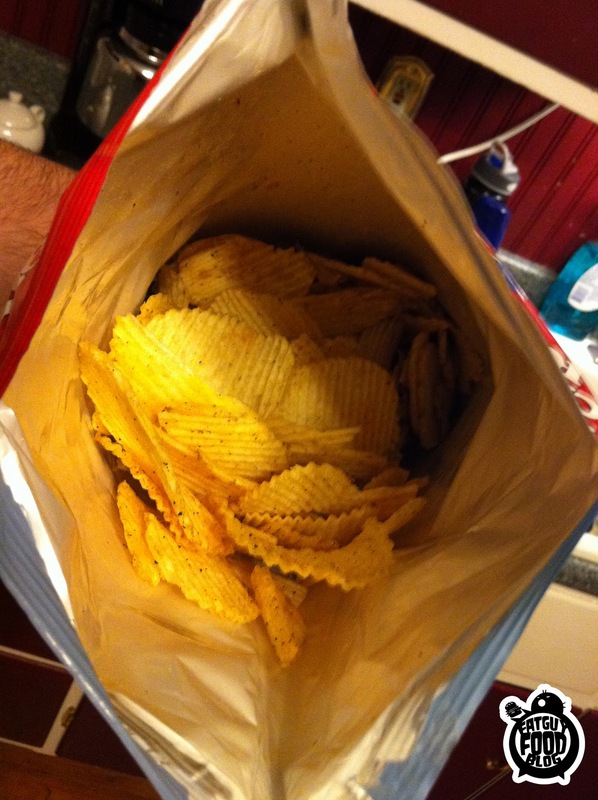 That's all these chips taste like. 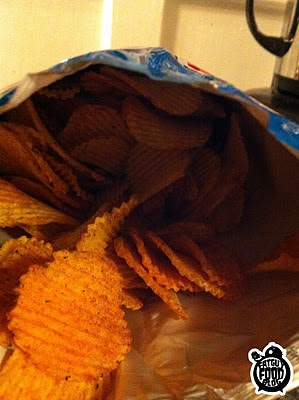 There might be a hint of cheese in there but that blunt chili taste is so overwhelming that I found myself quite done with this bag of chips after about a handful. Bottom Line: If generic chili flavor is your favorite thing in the world then scoop these bad boys up before they are gone, because I imagine we won't be seeing them for long, because ladies and gents...they are not good. Our third and final entry into this grudge match... LEGENDARY PHILLY CHEESESTEAK! These chips had me so excited that when I finally had them in my hands I wanted to cheer and run to the check out lane holding them up above my head. Look at that bag! Check out that Cheesesteak on there! It looks like the best sandwich I've ever seen. Which means these chips should be the best chips ever, right? Well...they are weird. They are cheesy and you can taste onion...but they are a little strange. 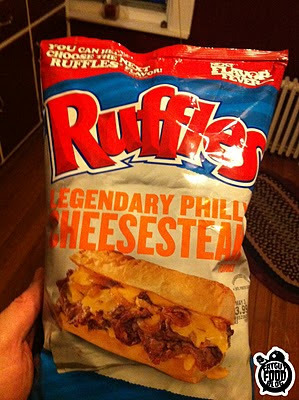 I liked them and I feel like the aftertaste at times gave me a flavor that could definitely be described as a cheesesteak but then other times I just kind of stood there with a puzzled look on my face trying to figure out what I was tasting. Bottom Line: A weird flavor. Sometimes it delivered, other times it was just strange. Not bad and definitely worth a try. They are hard to say no to, because come on, we all want to try chips that are flavored like a damn Steak and Cheese.